I’m not sure if you’ve been following me on Instagram lately but I’ve been on a roasted chickpea craze at the moment. Since I had my first taste of Indian Roasted Chickpeas, I’ve been craving for more. 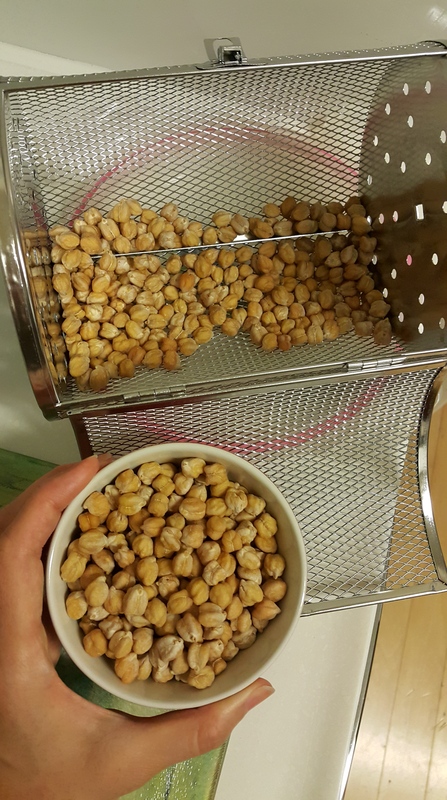 Little did I know that the real method to making commercial roasted chickpeas is so much work and close to impossible to recreate because of the roasting equipment they use, the time and techniques. I know there are alot of posts out there regarding roasting chickpeas but the end result is nothing like what I’ve had. 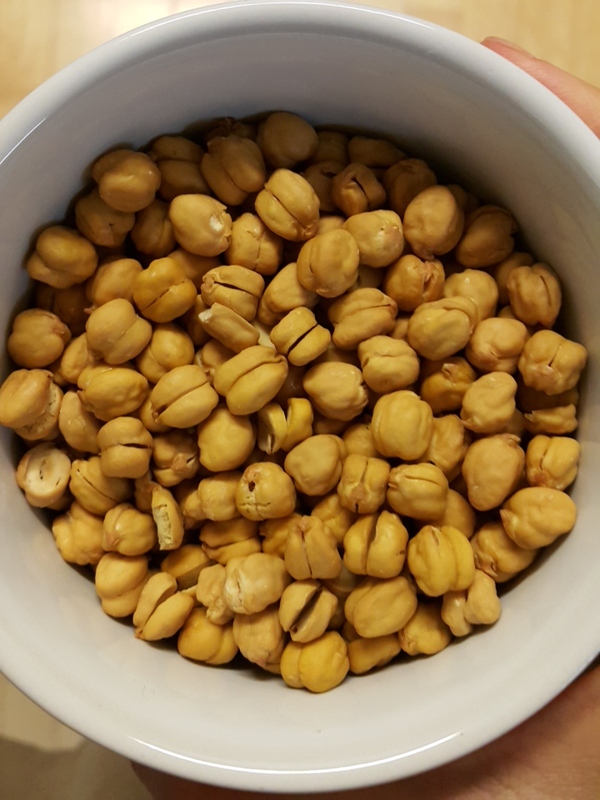 I’m talking about dry, chalky, cripsy, crunchy and powdery like texture of the roasted chickpea that ends up like a paste after crunching on several of them as you swallow. It’s nothing like what you roast in a home oven because I’ve tested most of the recipes online and alot of them add oil which is not what I want. 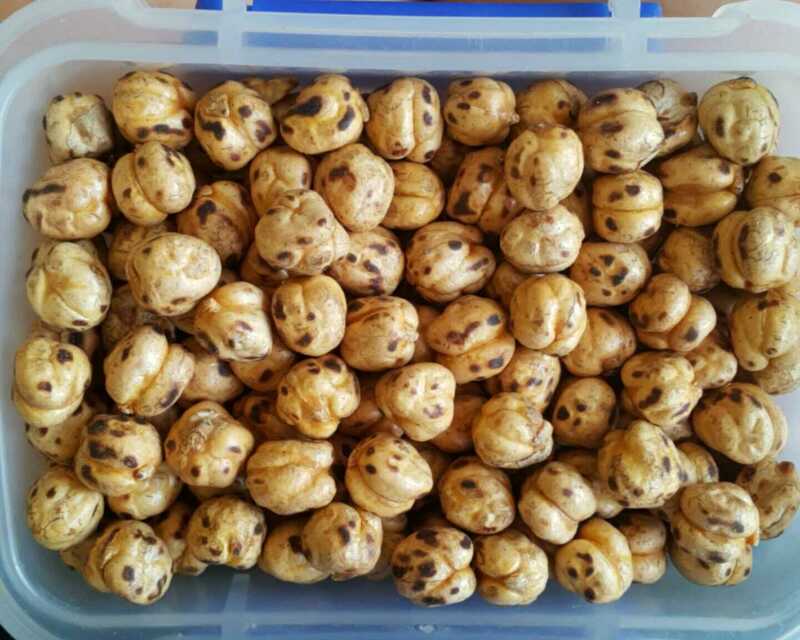 There are 2 types of Dry Roasted Chickpeas, Indian and Turkish. 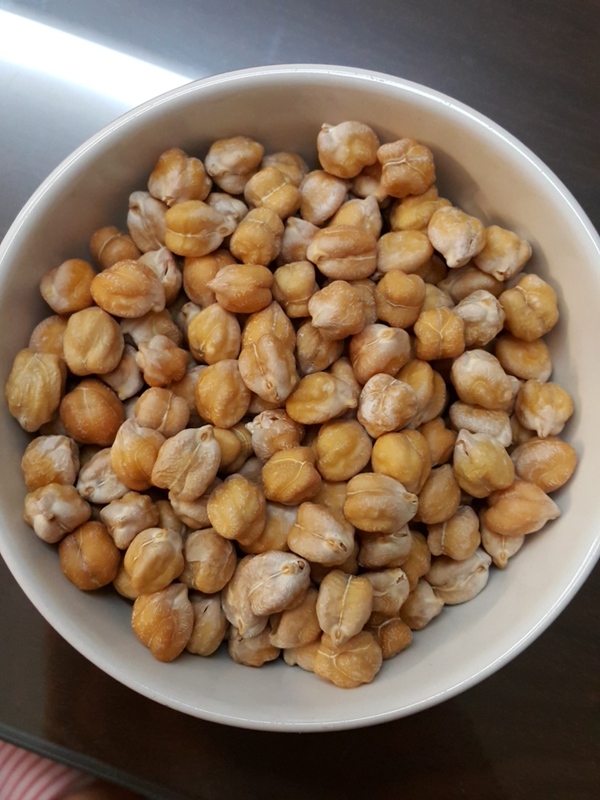 The Indian is plain Roasted Yellow Skinless Chickpea/Gram and the Turkish is Leblebi which are Double Roasted Chickpeas, Yellow (skinless) and White (with skin). I’ve tried and tested a few, made 2 batches that are no good, I even bought a new airoven specially to recreate it. Thanks to my other half who reluctantly agreed to it. 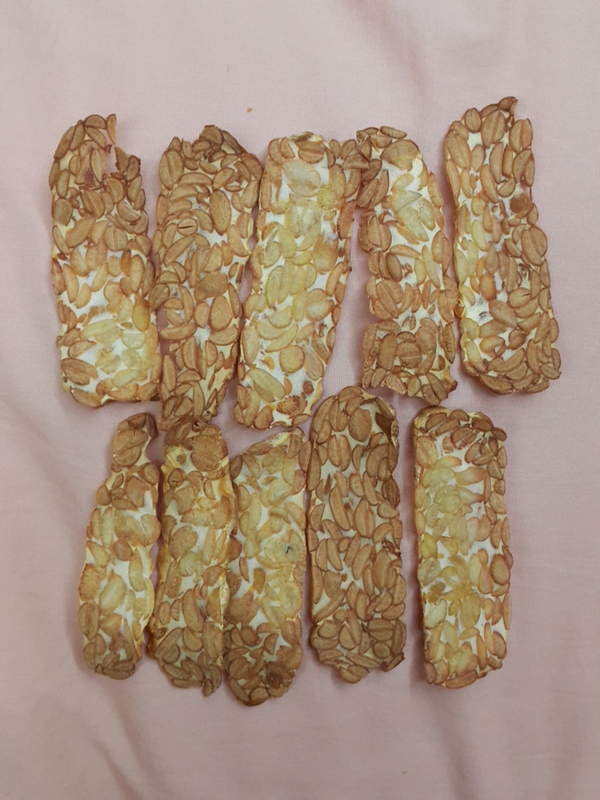 I tried recreating the notorious dry roasted chickpeas with heated air because that’s the best way to make things crunchy without added oil and to evaporate water in the quickest way possible. Yes, I did my research well. Just so you know, I have a gas oven so there is no grill option, no fan option so it was impossible to recreate the perfect oven roasted chickpeas without oil. Mistake Number 1: Not removing the Skin (an advice which was later suggested to me by a good friend, Jean T). I then decided to try another batch, which I soaked for 2 days, dried 2 days, boiled and had my lovely husband take the time to pop off their skins which I then air roasted in a rotiserie basket. And voila, they came out crunchy and crispy but not powdery. But the flavour was LOVELY! I liked the flavour better than the commercial roasted chickpeas I have to say and the texture was to my liking too! Oh the feeling of success was overwhelming. They were so delicious and I really enjoyed munching on them. 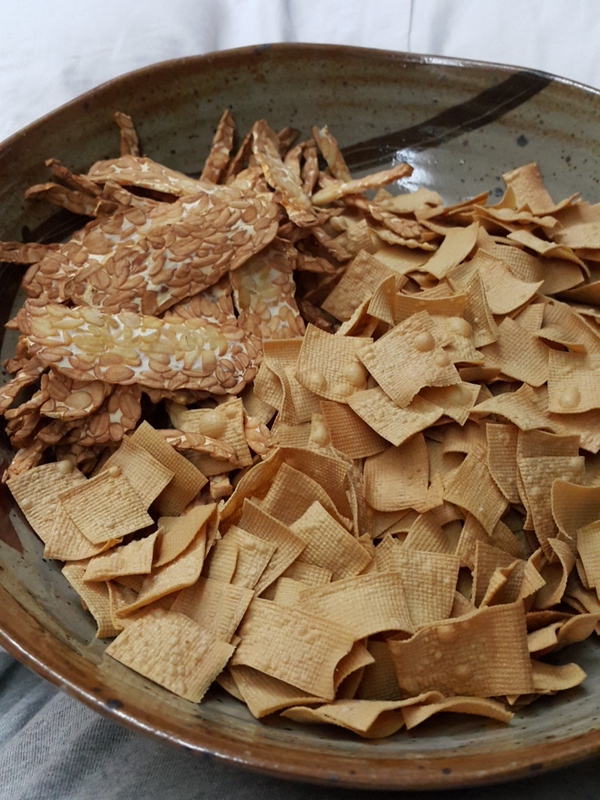 I’m addicted to crunchy and crispy food. I can have them every day for every meal but yes they make me bloated and the other thing too but I don’t care, I’ve got crispy crunchy homemade chickpeas!!!!!!! I have another batch in the fridge drying out, waiting to be air roasted which I think might just happen sooner than you think. Another point picked up is to add baking soda when soaking them and also when boiling them because it will break down the chickpeas faster and you’ll end up with super soft chickpeas in no time. Even the skin will just fall off the chickpeas, it’s that soft! You can leave the skin on when making hummus! 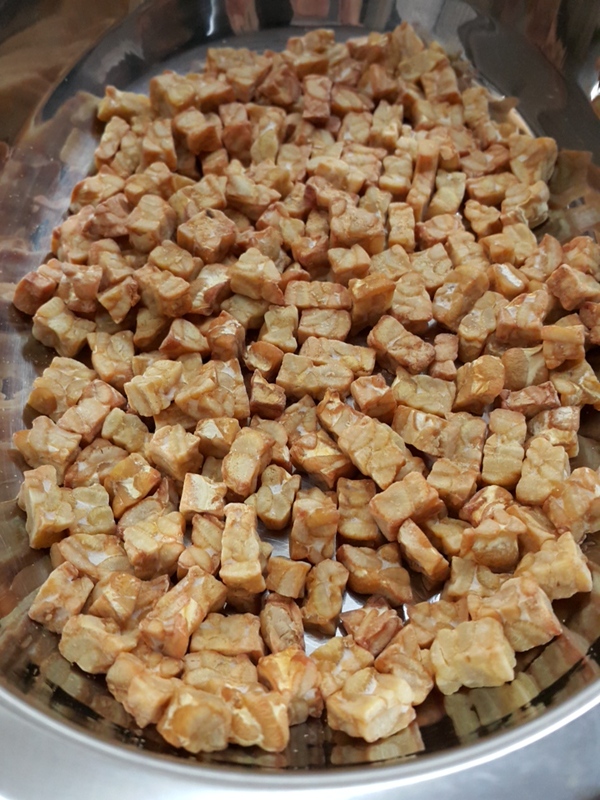 I also experimented with other crunchy goodness with my new air fryer (and my gas oven), namely tempeh cubes and my favourite midnight snack of tempeh chips and tofu chips! YUM! Does anyone else have an addiction to crunchy food?